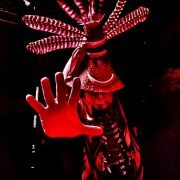 Soriah, which translates as “Pleiades” in Arabic, is the stage persona for the internationally recognized artist, Enrique Ugalde. Soriah’s craft is a blending of traditional Khöömei (Tuvan Throat Singing), tempered with Soriah’s own visceral force. Performances vary from being steeped in tradition and bound to its constructs to more experimental fascinations with electronic and acoustic accompaniments, and introducing Butoh and Ritual Performance Art. Soriah’s use of Khöömei as a transportive medium is an offering to nature in her own tongue, that of organic sound whether it be wind, water or the mimicry of animals. Soriah takes an annual sabbatical to Tuva to study with various masters and to compete. The 2008 Fifth Quinquennial Ethnomusicology Symposium, “Khöömei: The Cultural Phenomenon of Central Asia”, has honored Enrique Ugalde, “Third Place”, the highest a non-native to Tuva has yet placed. The Üstüü-Khüree Festival awarded him “Best Foreigner” for their 2008 selection, in 2014 he won 2nd place in the National Kargyraa Competition and at the 2016 Tuvan National Kargyraa Competition, he won “The Greatest Developer of Kargyraa”. The rest of the year Soriah travels the globe with extended tours performing in various cities and enclaves of Japan, crooning in the cathedrals and ruins of Mexico, and intoning in ocean caves and amidst the swamplands of America. The artist has been invited to perform at society events such as The 2009 Peace Ball in Washington, D.C. for Obama’s inauguration, and by brigand artist elites, to sing at various installations of note at the Burning Man Festival. One becomes encased in an awe-laced ceremonial pallor while in attendance at a Soriah performance. A deep spiritualism imbues each piece performed, whether entirely traditional or exhibiting a fusion of music, movement and meditation that Soriah describes as Vocalized Ritual Drone.